Come Join Us for Coffee With Cops! Please join us for our latest Coffee with Cops! 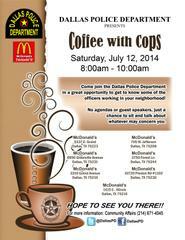 It will be held this Saturday, July 12th, from 8am-10am at seven different McDonald’s restaurants. Several officers will be on hand to answer any questions you may have or listen to your concerns. Come meet the officers who patrol your neighborhood! We’ll see you Saturday for coffee!